I am attracted to stories about individuals who create new or false identities, especially when elaborate fabrication is involved. The works presented in “Edham the Atheist” draw on the painstakingly constructed identity of one such individual, Ismail Ahmed Edham (1911-1940), an Alexandrian Egyptian with literary and scholarly aspirations. Edham flaunted a long list of academic credentials he attained while pursuing advanced degrees in the Soviet Union. However, it has been suggested by some that Edham never left Egypt. In Egypt, if Edham is remembered at all, it is for his polemical treatise Why am I an Atheist? (Limadha ana mulhid? ), which was printed and published in 1937 by The Cooperation Press, my grandfather's publishing house on the rue de France in Alexandria. In this tract, Edham explains how he came to form a group in Istanbul called The Eastern Association for the Advancement of Atheism, "a kind of moderate movement spreading free thought and atheist mission work." By his own account, in 1931 when the movement failed, Edham left Turkey for Russia to study mathematics and theoretical physics, returning to Egypt in 1934. Three years later, the publication of Why am I an Atheist? would be met with outrage, placing Edham in the spotlight. In July 1940, Edham’s corpse was found floating in the Mediterranean Sea off Alexandria's Gleem beach, a suicide note pinned inside his coat pocket. He was 29 years old. 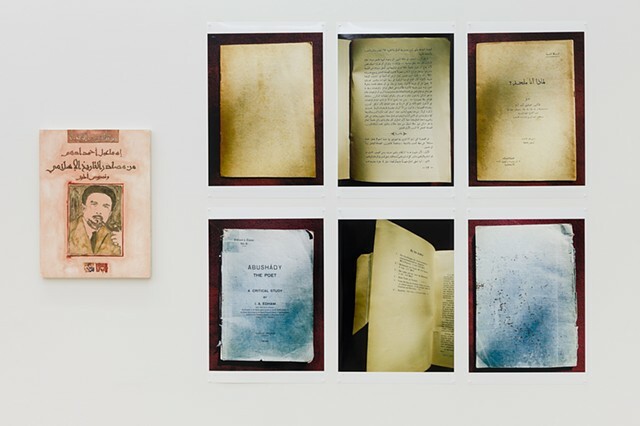 For this installation, I have assembled a selection of photographed pages from Edham’s infamous tract, and from the biography he wrote of my grandfather, Abushâdy the Poet: a critical study. I have also included a painting of the cover of one of Edham’s banned books, which bears his portrait, and which starts the series, “Tracing the Covers of Nonexistent Books.” Both the portrait and the photographed pages, which show Edham’s Soviet credentials, reveal a young North African man who needed to reinvent himself, and to whom a prestigious education in the Soviet Union seemed the perfect solution. Joy Garnett is an interdisciplinary artist and writer living in Brooklyn, NY, who works with archives as both subject and medium. Her work has been included in recent exhibitions at the Museum of Contemporary Craft Portland, Oregon, the Houston Center for Contemporary Craft, and the BALTIC Centre for Contemporary Art (UK);. Notable past exhibition venues include the Milwaukee Art Museum, Boston University Art Gallery, MoMA PS1, the CUNY Graduate Center, and the Whitney Museum of American Art. Garnett’s work is part of the permanent collections of the National Academy of Sciences (Washington, DC), Philip Morris, and The West Collection (Oaks, PA). She is represented in New York by Winkleman Gallery.